Lots of people, of all ages, come to us for the full story on skydiving health restrictions. After all: This “skydiving” thing is a high-intensity undertaking, and the medical restrictions around skydiving must reflect that. 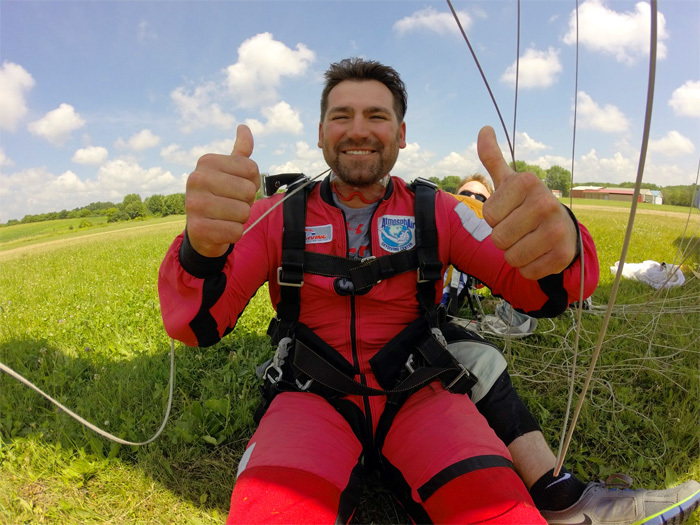 If you manage a medical condition but your bucket list contains skydiving, you need to know what questions to ask – and of whom – in order to really know if it’s a good idea to make that jump. We first want to applaud you for your foresight. We only have one body to carry our soul around this big, beautiful world, after all, and we’re charged with taking good care of it. If you’re skydiving with high blood pressure, skydiving with a disability, skydiving with diabetes, or skydiving with any other health consideration, you want to be sure that the risks aren’t too considerable. You’re already walking a steeper path than most. 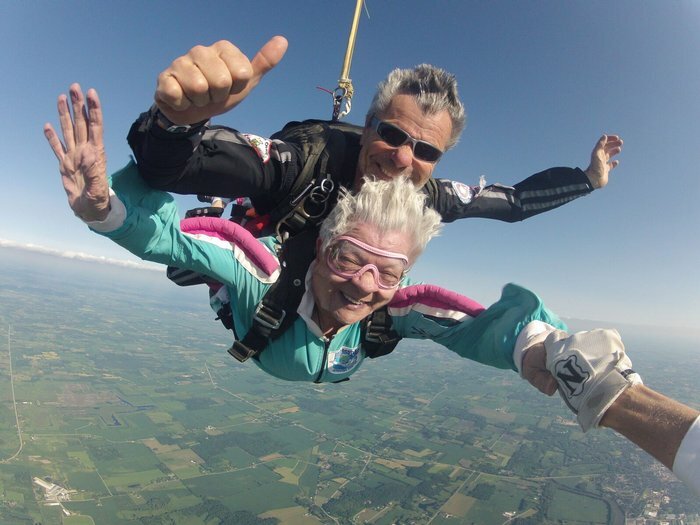 Not all older clients have skydiving health restrictions – Anna May is 83 and jumps with us every year! Indeed, dear reader. A big part of facilitating skydiving for the mobility-impaired leans on the skill and experience of the tandem instructors. Lots of dropzones are unable to take on the risk of jumping with disabled tandem students because they aren’t comfortable experimenting with methods, especially from planes on the cozier side of the size range. At the Wisconsin Skydiving Center however, our long experience in supporting new skydivers of different health and abilities allows us to extend the miracle of human flight to almost all comers, assessing each individual based on their unique level of mobility and how they fit into the tandem skydiving harness. Except for our strictly enforced weight limit, Wisconsin Skydiving Center doesn’t preclude anybody from jumping right out of the gate. That said: each individual jumper with health restrictions would need to be assessed on a case-by-case basis, dependent upon things like the exact nature of the medical issue, flexibility and strength. Our Chief Instructor, Bo Babovic, personally handles all tandems that require additional attention in regards to mobility. If you have mobility issues, don’t be a stranger. Come on down to the DZ in advance – and plan to spend a weekend day bar-b-quing, sky-watching and sunning with us – to see what’s possible. You too can make a successful skydive! Combing the internet for information on skydiving health restrictions is a circular endeavor indeed. At some point, if you really want to skydive (and you do! ), you’re going to need to have a conversation with your doc. You’re also going to need to have a conversation with a reputable, professional dropzone with the experience and know-how to advise you – in your unique situation – thoughtfully. It should go without saying that our advice here is not the advice of a medical professional. We have, however, seen a lot in our time and travels, and we’re an excellent first port of call for skydiving health restrictions information. In conclusion: if you’ve got a special case you’d like to discuss, get in touch with us. A member of the team will be more than happy to help. When you’re thinking about skydiving and health, the key point to remember is this: Skydiving is a sport. It can be an intense one! The rule of thumb is to address the usual suspects (high blood pressure, glasses, age, weight, diabetes, bad back/neck/knee/ankle/spleen, etc.) in the athletic context. 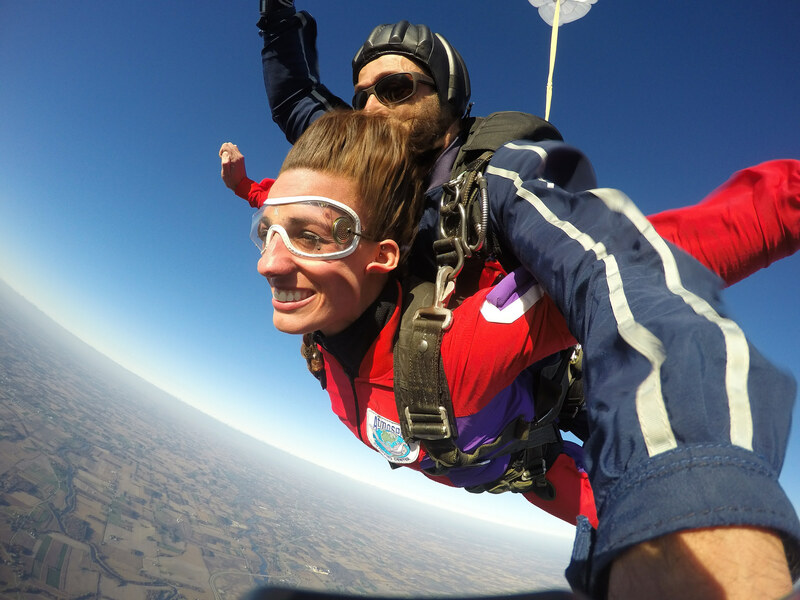 The upshot is simple: Skydiving might not be as impossible as you’d think. And it’s definitely worth it. We look forward to seeing you down at our dropzone!